At 9:00 AM last Saturday morning I stood at the starting line of the Hat Run 50K in a grassy field in Susquehanna Sate Park, MD (photo at left by Jeff Hinte, HAT Race Director). I was contemplating the fact that I was about to run 31 miles on hilly trails that would take me over some 9,800 feet of elevation gain (see elevation profile below), and I knew that pain was coming. Some might think that doing such a thing is crazy, but at that moment, I couldn’t have been in a more perfect place. I was completely relaxed – the butterflies and pre-race jitters that normally hit me just before the starting gun fires were nowhere to be found. I relished the challenge that lay ahead. Over the next 5 hours, 52 minutes, and 48 seconds I ran through fields, along gravel roads and forest trails, through streams, and up and down hills. Endless hills. I ran fast, I ran slow, I walked, I hobbled, and at one point I even sat down and took off my shoes (they were filled with sand). I had moments where I felt like I was flying, and I had moments where seemingly all of the muscles between my knees and my hips were screaming at me in unison. At one point my quads, groin, and hamstrings were on the verge of cramping all at the same time, so I stood in a cold stream until the pain subsided. I ate boiled potatoes dipped in a bowl of salt (pure heaven!). I ate peanut M&M’s on the run and had to use my hydration pack to get the rainbow of color off my hands after I scarfed them down. I ate multiple bananas. In the final mile much of this food almost came back up, but I fought the waves of nausea and held it down. And through it all, I had fun. Scratch that, I had an absolute blast! The details of the race are not so much the important part of the experience. What made this day so special was the people. I had so much fun because I was able to share the experience of running the HAT Run 50K with good friends, none of whom I had ever met before in person, but several of whom I feel like I have known my whole life. The reason I had decided to come to Maryland in the first place was to meet up with friends from the dailymile social training network (see photo above). They had done the HAT the previous year, and the stories they’d told of the experience in the Maryland woods had become legendary. A bigger group was in attendance this time around, and it was great to finally meet my friends Andy (thanks for the Panera breakfast! ), Steve, Ally, Thomas, Brodie, Jenny, Jeanne, Smitty, as well as several others. I saw many of them out on the course, and we hung out both before and after the race. I also was looking forward to meeting up with Chris McDougall (see photo above). We’ve exchanged emails off and on for awhile, and as I was mulling doing HAT last Fall I got an email from him saying “If you’re in, I’m in.” Hard to turn down an offer like that! Chris was gracious enough to put me up at his house the evening after the race, and I discovered that we have more in common than our fascination with running form and footwear (or lack thereof). Let’s just say it’s comforting to know that I’m not the only father who thinks the Barbie Princess and the Pauper soundtrack is a musical masterpiece worthy of being belted out when alone in the car. Chris’ family was eminently hospitable, and I owe his wife a huge debt of gratitude for allowing me to fill his house with running talk for a day. My honest plan for the race was that I really had no plan. After the starting gun went off I settled into a comfortable pace alongside Chris and a few others. Being an Ultra newbie I followed everyone else’s lead and walked the uphills and ran the flats and downs. The pace was more than manageable, and I felt like I could go all day. I had a nice time chatting with Chris about running, shoes, etc., and we had some nice conversations with surrounding runners. I remember the topic of hashing in Laos coming up at one point – funny the topics that come up when on the run. Around the five mile mark (guessing) there was a stream crossing (photo at right by Jeff Hinte) and I intended to rock hop to the other side so I wouldn’t soak my shoes (I had decided to go with the New Balance Minimus Trail). I wound up slipping on a wet rock and mashed my opposite forefoot onto another rock in an attempt to prevent myself from falling into the water. The pain was instant and piercing, and my immediate thought was that I had broken something – not sure if a shoe with a rock plate would have helped or not, but the Minimus Trails were marvelous aside from this one moment. I kept running, and eventually the pain subsided to a dull ache. A few miles later I kicked a root and collided with the ground. It’s funny how trail spills seem to occur in slow motion, and I could feel my legs giving way as my body slowly plunged to the earth. I managed to bruise my hand badly by using it to brace my fall, but thankfully my legs escaped unscathed. I managed to stay on my feet for the rest of the race. One of the things about trail running on single track that is different than road racing is that passing can be a challenge. On trails you often run single file (see photo at left by Jeff Hinte), so it’s easy to get separated from people you are running with as you try to maintain a comfortable pace. Around mile 9-10 I got ahead of Chris a bit as we mingled with a bigger crowd of runners, and at one point I looked back and I could no longer see him. The crowd in front of me was sparse at that point so I decided to keep running at the pace that felt most natural at the time. We entered a section on crushed rock road for several miles, and I was feeling really good so I turned on the jets for a bit (ran a 7:00 mile here, which in retrospect probably was a mistake). I passed my friends Thomas and Jenny and said a quick hello, then continued on through the aid station, grabbing a snack as I passed through. From about mile 13 onward I pretty much ran solo. This worked out well for me since I tend to turn inward into my own head as I start to focus on a race once the initial excitement wears down. I passed a lot of people over the next 5 or so miles, and made it through the first big loop at mile 18 feeling phenomenal. As I started the second loop I felt like flying, and I started racing down the downhills a bit too fast. This set up my inevitable crash around mile 25, when my quads started to tell me that they had had enough. I stopped to stretch them out, only to find that the moment I flexed my knee my hamstrings rebelled and started to knot up in cramps. There would be no quad stretching for me. From that point on it was a constant battle to prevent my quads, groin, and hamstrings from locking up completely, but I fought through with a bit of help from a cold leg soak in a stream. Every hill seemed twice as steep on the second loop, and the roads that I cruised down on loop one didn’t provide nearly the same degree of respite on loop two. Around mile 29.5 I saw my friend Andy up ahead – he was hard to miss with his bright orange du-rag covering his bald head. I set my crosshairs on the du-rag and managed to catch up with him. It was clear that he was hurting, and I wasn’t doing so well myself, so we marched the final mile in with only very short spurts of running. As we approached the finish line we saw Steve and Ally shooting pictures (Steve is an amazing runner and had finished in third place! ), which gave us a much needed lift, and we ran the final stretch across a field to the finish line together, crossing in 5:52:48. I was mentally lucid for the entire race, but once I stopped running I started to fall apart a bit. I needed food, and I needed it badly. I remember several people trying to talk with me as I trudged into the aid station, but I have a hard time recalling much from those few minutes. After a hot dog and several cups of Coke I began to bounce back, and the celebration ensued. I hung out and had a beer with the dailymile crew, shared some war stories from the race, and had an all around great time – just an amazingly fun and genuinely caring group of people. I caught up with Chris when he crossed the line – he’d also had cramping issues in his thigh adductors (seemed to be a theme for the day from many people), but he finished happy too. The common sentiment was that the race was tough, but well worth the effort. There are truly few better ways to spend a sunny spring day than running trails with friends. Several people asked me afterward if I would do another Ultra. I kept thinking to myself as I ran that I couldn’t imagine how people manage to run 50 and 100 mile races – I had nothing left after 31. I’ve learned never to say never, and I’ve definitely been bitten by the Ultra bug. Ultras are a totally different beast than big road marathons – much more laid back and they test you in different ways. For me, HAT wasn’t about speed so much as it was about enjoying the moment and ensuring that I had enough left in the tank to finish. I flew when I felt like it, walked when I needed to, and never felt guilty about it. My pace ranged from sub-7:00/mile on a few downhill road sections to near 20:00 on some of the steeper uphills, and I never ran a steady pace for any length of time. That, however, is what made it fun – the terrain and strategy were constantly changing, and the repetitive nature of a road race was nowhere to be found. Loved the race recap, Peter and congratulations on a very solid debut ultra. Your experience reminds me of my first HAT last year, and I know for sure you’ll be back one day for more. Recover well, and great to finally meet you. Nice work out there! I know several folks who have done this race and all give it solid reviews. You did a great job on your maiden voyage into ultras! Congrats, again, Pete! That race looks challenging and awesome. Nice lookin” water crossing, too! Loved the race report Pete, thanks for posting. All this HAT talk makes me want to test the waters next year! How’d you like the NB Minimus Trails for the run? Great report, Pete! Almost (almost!) makes me want to attempt an ultra. Great report. Your cramping was caused (or at the least compounded) by lack of electrolites. I don’t see any mention of you taking salt tablets. Potatoes dipped in salt usually aren’t enough. Did you take scaps or ecaps? Sounds like you had a great first ultra!! The VHTRC gang put on a ton of really low-key races and, like you said, it’s about enjoying the moment and the trail. They are a whole other beast from road running. I’m glad you had fun! Well done Pete! Loved the recap. Recover well and get ready for Boston. Great recap of the HAT Pete. See you there next year? We’ll see…too far ahead to plan yet! Thanks for the great recap of the race. Sounds like it was a lot of fun (as it should be). I was wondering if you could satisfy the running shoe nerd in me and discuss your thought process in deciding to go with the NB Minimus Trails. the recap with shoe talk! Sounds like you had an amazing time! Congrats and recover well! Nice summary of an amazing event Pete, from the company you kept to the race experiences. I appreciate you taking the time to share it. 50 milers are more of the same. I’ve adopted a run/walk strategy from Kevin Setnes that has worked well. Also, running more than 3 hours you would want to plan on electrolyte supplements (s-caps) every 1/2 – 2 hours depending on temperature. Great job on your 1st ultra and I’ll be looking for a shoe report…mine are getting trashed after about 150 miles. Compression – helps with recovery and feels good. hospitals as a way of improving blood flow. oh c**p! I had intended to add “big grin!” to make sure everyone knew i was goofing. i screwed up my post. Sorry. I had originally bracketed “Big Grin” with the greater than & equal than symbols (above the , and . keys on a US Windows keyboard). I think Disqus might interpreted those symbols as HTML something and dropped some text. i guess i should know that those symbols should be avoided on a web page! Wonderful recap! Congratulations on your experience at the HAT. It is a race worth repeating. Great write up Pete, congrats to yourself and all the rest of the runners that took part. The total ascent of nearly 10,000ft is huge, three times as much as I’ve did on my first ultra (the Loch Alsh Dirty 30 and ~3000ft ascent/descent), and my quads were screaming at me in the last five miles, can’t think how I’d have coped with 3 times more hills! Your description of finishing with a fellow runner exactly mirrors how I finished both the ultras I have done so far. For both the Dirty 30 and the 41 mile River Ayr Way Callenenge (RAW), rather than get competitive in the last few miles it was about all about mutual support and comradary. We were all suffering, and goodwill and homour just washed this all away. Awesome job Pete…the Boston hills will be nothing after this. You are correct about the spirit of local events and trail runs. We invite you to WV for the Freedom’s Run series…low cost, National Parks, non profit, all volunteer, and beer. Nicely done! I wanted to do this race, but thought it too close to Boston. Apparently you saw no such problem… Chris is a fascinating guy, and I had the pleasure of running with and talking to him last spring. He’s certainly not fast, but sure seems to enjoy himself when out running (barefoot on this occasion). Unsolicited advice for Boston: You’ll be in the staging are for 2-3 hours before the race starts, so bring extra warm clothes and something to sit/lie on (I’ve got an inflatable pool mattress). You can put all your gear in the drop bag 20 minutes before the gun goes off, so no worries about leaving stuff behind. Thanks for the advice – it’s always appreciated, unsolicited or not! I had to smile at your willingness to sacrifice your hand while falling to protect your leg, and at your sub 7 mile, as I’d had the same experiences at my first 50K in Huntsville, TX. As you noted, Ultra’s are a different beast that road races, and are far more enjoyable – especially as was the case for you in doing the event with friends. I suspect that you’ll be astounded to see just how much more quickly you recover from a 50K vs. a marathon, which I believe results from the softer running surface, the much slower pace, and the far greater diversity of muscles that are required. Hope to read more about other trail adventures in the future. Looks like a nice run and I love th MD woods. But the elevation profile for this race has about 4500(+-) ft of accent and I guess about the same descending. I calculated it from the sites elevation profile (link to hatrun.com….. The site says 9800 ft climbing ( I guess they mean up and down). 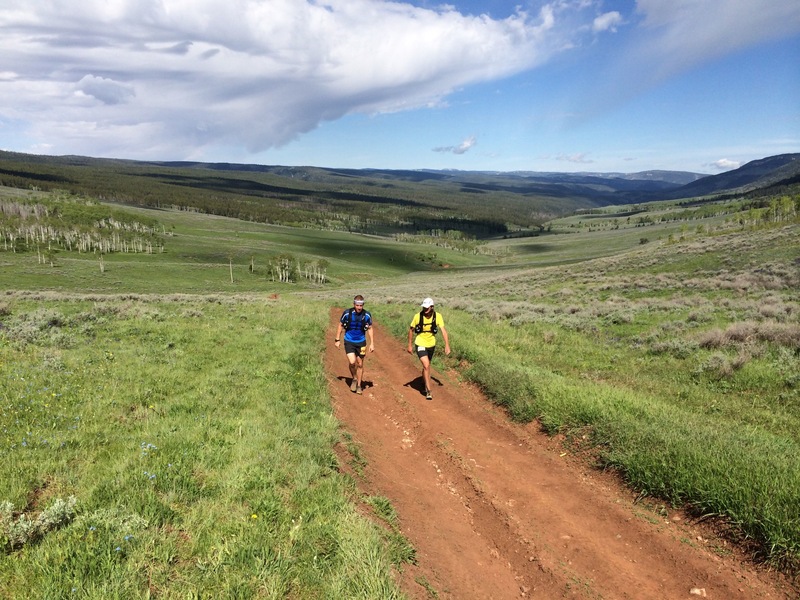 The race is not 19,600 of elevation change. My Garmin recorded 10,000 feet of ascent – sure felt like it! Pete great review. My wife and I are running the HAT50k on the 24th. Sounds like a fun run. I also plan on wearing the NB Minimus. I have the new 110’s but I love running in the Minimus. If my feet need something different I will switch into my trusty MT 101’s or the 110’s. Good luck – great race!